Our 9th grade classes have been reading Robert Fitzgerald’s excellent translation of The Odyssey. At the beginning of every book, “young Dawn spreads her fingertips of rose to make heaven bright”. My students have heard this phrase so often that they chorus back to me “fingertips of rose” when we read aloud. 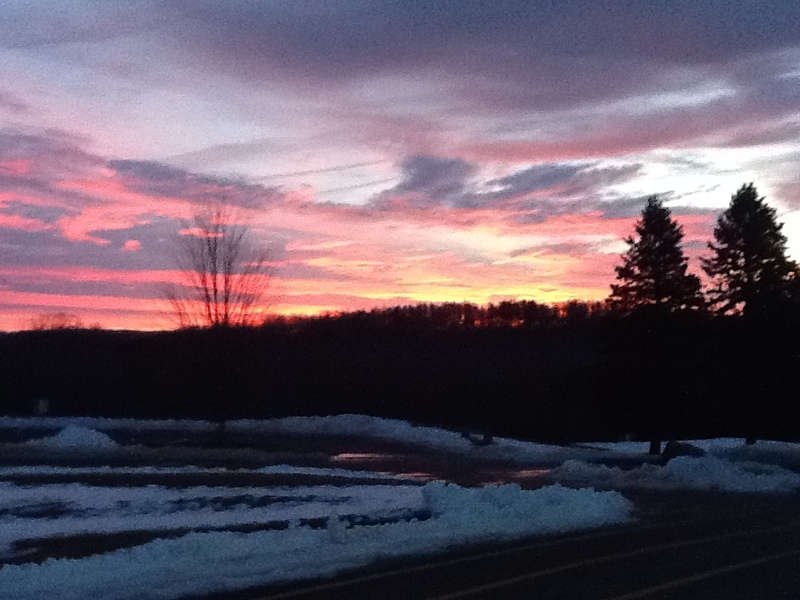 One morning this past week, I raced up the hill to school to get my iPad so I could capture this picture of the “rosy fingers” and put it on the class wiki. We dutifully started The Odyssey with the “Invocation to the Muse” and Books 1-4, but the Telemachus “coming of age” story did not really capture their interest. Meeting Odysseus in Book 5 did not improve their respect for the “worthy man of twists and turns.” Once we read Book 9, the meeting with the Cyclops, Polyphemus, their interest was revived. Apparently, they enjoy a good story of man-eating monster as much as previous generations from 2020 years ago. I have only been able to locate about a dozen copies of this translation in the secondary market, so we did have to buy a class set. These replaced a worn set of the Richmond Lattimore translation. There will be an audio version of the Fitzgerald translation available in November 2013 I will be ordering so I will finally be able to hear how to pronounce all those Greek names!. The inclusion of the narrative confirms what most writing teachers recognize, that writing a narrative gives a students a better appreciation for reading a narrative. You and your partners are to create a modern equivalent of The Odyssey. The setting is Wamogo High School; the hero a 9th grader – Fresheus or Freshiope. Your character must make their way through a day at school, facing modern equivalents of the Lotus Eaters, Cyclops, Sirens, and all that Odysseus encountered. The goal is simply to get home alive, where the or she can relax and feel safe.You must mirror Odysseus’ adventures, including how he solves the problems (trickery, patience, skill, self-control, etc). The essential nature of the obstacles must be the same, in the same order, but set in modern Wamogo. Each student in a group working on The Wamogossey is required to write three adventures: a single narrator needs three (3) adventures; two people writing the Wamogossey need six (6) adventures; three members of the group need nine (9) adventures. This organization assures that there is an equal sharing of responsibilities regardless as to the size of the group. They compose the narrative on Google Docs; each narrator writing in a different color ink. In addition, to assure fairness in grading, we allow students to have some feedback on the distribution of points. The project is assigned a base grade (EX: 40 points) Once the project is graded based, that number is multiplied by the number of students in group. For example a project worth 40 points may be awarded only 34 points. If there were three members of the group, then there are 34 X 3 points available, or a total of 102 points. The members of the group then determine a fair distribution of points; slackers are usually “outed” by members of their group. We rarely need to intervene. after the break downs and endless driving in the field. to save my life, to get home to the barn. Of these adventures, Brandon, tell about me in my school day, lift the great song again. In addition to the modernized twists of Homer’s plot, each adventure needs an epithet (“grey-eyed goddess”) and one Homeric simile. My students call these similes “enough already; we get the point” similes.There is also extra credit for using vocabulary from The Odyssey. I was hurrying to class, I was going so fast, I felt like I was in a race car, and the people around me are in a fuzz. All of a sudden, I saw the huge Eaganphemus standing in my way. I almost slammed into him, my wheels spinning so fast. I tried to get around him, but I couldn’t But, I happened to have M&M’s in my pocket, so I threw them at him. He seemed overwhelmed! He tried to catch all of them at once!! Once he was trying to gobble them down I raced past, now that he was distracted. I somehow survived getting past him. As the semester ends next week, the students will have finished their hero’s journey. Odysseus will return to Ithaka and to Penelope, and, yes, another “Dawn will spread her rosy fingers…”. I may get to run up the hill again to snap another picture.